Start the holidays with sounds of joy! The Old Time Fiddlers Association continues their monthly First Sunday Fiddlers’ Jam sessions at the Ely Stage Stop & Country Museum. On Sunday, December 6, they’ll be performing beautiful Americana music with a possible sprinkling of holiday cheer to get you in the spirit! Come ready to clap your hands and tap your toes. We’ll even make room for those who want to get up and dance! This is a free, family friendly event for all to enjoy, young and old alike. The fun begins at the museum at 11:00 a.m. with the Fiddlers playing in the barn from 12 noon through 2 p.m. Come early to enjoy all of the newest museum acquisitions and displays. Enjoy the music with beverages and tasty treats provided by the docents. Bring your own wine and sip it in Ely Stage Stop wine glasses that are available for purchase. Take a musical break from all of that holiday shopping. Learn more about the Christmas Marketplace that will take place in the barn on Saturday, December 19. Local artists’ handmade goods will be available for those last minute gift purchases that day. Attendees frequently make donations and the money collected is split between Ely, to help fund the current all-volunteer blacksmith shop project, and the Fiddlers Association, who uses it to partially fund their scholarship programs. The Lake County Historical Society’s Ely Stage Stop & Country Museum is located at 9921 Hwy 281 (Soda Bay Road) in Kelseyville. Current hours of operation are 11:00 a.m. to 3:00 p.m. each Saturday and Sunday. Fiddlers’ Jams occur the first Sunday of every month. Visit www.elystagestop.com or www.lakecountyhistory.org, check out the stage stop on Facebook at www.facebook.com/elystagestop, or call the museum at 707-533-9990. 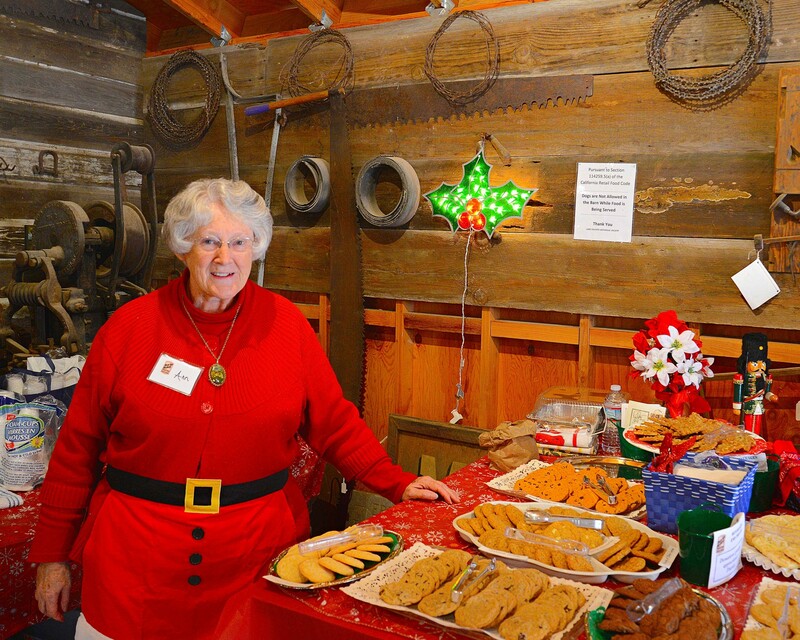 Ely elfin docent Ann Zito with an array of tasty Holiday treats offered at the 2014 December Fiddlers’ Jam. What will she surprise us with this year? Photo courtesy of Greg Blinn.